Parrot Zik 2.0 Hands-On: The World's Most Advanced Headphones? Maybe. The first time I tried the Parrot Zik headphones, my jaw dropped. The world around me disappeared. I felt like I was right there in the sound studio with the artist. So you can imagine my excitement to try the updated Zik 2.0. If you don't mind paying $400 for headphones, you should be excited too. I'll just get this out of the way: the Zik 2.0 headphones—which are advertised as "the world's most advanced headphones"—are very impressive. The improved design is both handsome and understated. The features are many and varied and possibly a little bit overkill for some people. The app is incredible, though it might also be overkill. And, of course, the sound quality is fantastic. Did I mention they cost $400? Today, you can pre-order the Zik 2.0. But should you? I've spent 48 hours with the headphones, and I've got some insight there. Let's see if we can decide whether they're worth that hefty price tag. Let's start with the basics. They're pretty. Unlike the original Zik headphones, which more or less resembled cans of soup strapped to your head, the Zik 2.0 is sleek and svelte. The most noticeable change in the new Phillipe Starck design is a faux leather wrapping over most of the headphones' surface area. It makes them look, well, sort of squishy? I think Parrot was probably going for a more luxurious feel, like the leather on the headrest of a high-end Mercedes. But yah, it's kind of cheesy unless that's your style. The slim profile fits nicely on your head—though I will warn you that they will not accommodate big heads. I have a pretty big head, and after I stretched them to the max, they still felt a little snug. Still, the unique single hinge makes it a little bit easier to pull them on and off. If you like a lot of specs, you'll love the Zik 2.0. In an attempt to build the world's most advanced headphones, Parrot pulled out (almost) all of the stops. The headphones have so many features, you'll probably forget half of them even exist. Like NFC, which you'll probably use to pair them with your phone only once, because then they'll be paired. Speaking of pairing, the Zik 2.0 surprisingly comes with the aging Bluetooth 3.0. (Why Parrot didn't go for the superior Bluetooth 4.0 is beyond me, but whatever.) Perhaps because of the outdated Bluetooth, I had some annoying issues with connectivity, but eventually figured it out. As for audio performance, the cans sport 40 mm neodymium drivers and a frequency range of 20Hz-22,000Hz. Those aren't the absolute largest you can find on the market, but it does cover the entire range of human hearing and those numbers rarely matter much in practice. What might make a difference in sound quality is how you tune the headphones. The Zik 2.0 works with a free, eponymous tuning app that is absolutely bonkers. It's like an equalizer on steroids that's designed so well a child could use it. You've got super intuitive controls over noise canceling levels, a neat interface for the equalizer, an even better interface for a concert hall effect—I'll explain what that means in a second—and finally, pre-programmed tuning presets, some of which have been created by celebrities. Kind of hokey but whatever. The Zik 2.0 also come with touch controls on the right ear cup. This is a pretty common feature on higher-end headphones now, and it's actually really handy... when it works. These controls let you skip tracks or go back, as well as adjust the volume and pause the music with simple gestures—though it's sometimes tough to get the gesture right since there's no texture to help guide your finger. There are also a bunch of phone features that you might not ever use, and a bunch of bells and whistles that I'll get into in the next section. I thought that I was going to hate the app. Why in the hell would I need yet another app to listen to my stupid disco beats? Why don't I just adjust everything in Spotify? I'll tell you why: because the Parrot app is so much better. And it's fun to use. For any quasi-audiophile, listening to your favorite music with the Parrot Zik 2.0 app is like playing a game. Most fun is the equalizer. It's easier to navigate because it uses a circular interface instead of annoying sliders, and Parrot gives you some excellent suggested settings like "pop" and my personal favorite, "christal". Most useful is the controller that basically makes the music sound the way it would if you were listening to it in differently sized rooms. The options run from "individual room" to "concert hall." I tend to favor the latter. Regardless of what you pick, the sound quality is generally terrific, though there are weaknesses. 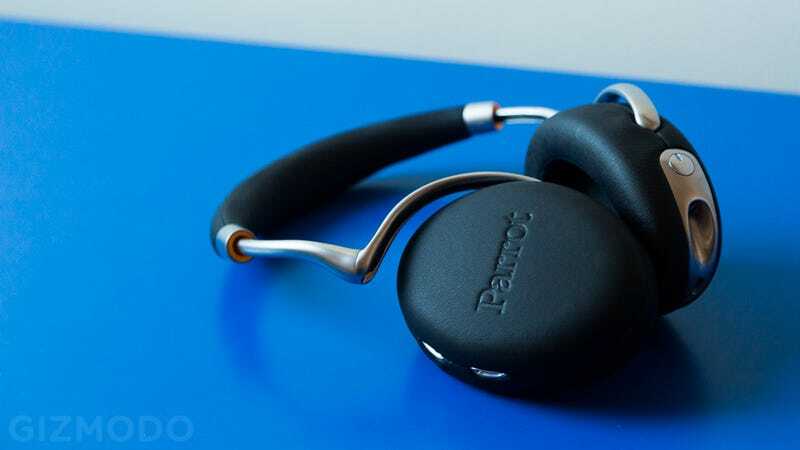 We'll get more into the specifics of where the Parrot Zik 2.0 headphones succeed and where they fail in a full review, but I'd easily put them up there with the Beats Studio Wireless and the Samsung Level Over. All of the words above this section are simply my first impressions of the Zik 2.0's. I used them constantly for 48 hours, but I'll need a bit longer to do a thorough review. The original Parrot Zik headphones were Gizmodo's (expensive) favorite two years ago, so we've got high hopes. Should you buy them? Not yet. It would be silly to spend the money when Parrot isn't even shipping them quite yet, and we should have a full review before then. Sorry for the suspense. They're $400, by the way, just in case you didn't pick up on that.